We can offer a range of automatic milking systems which can help save time and efficiencies on the farm as well as improve herd health. DairyProQ is much more than just another rotary milking parlour – It is a milking system where every function is fully automated. Each cow stall has an individual robot arm which extends from the side of the stall and directs the MilkRack to the udder. The camera on the arm will detect the teats and attach the cluster. Using the patented four quarter milking concept of the IQ, the cluster also pre-dips, strips, cleans’ the teats, milks and post-dips. After the cluster is removed it is rinsed inside and out as well as being disinfected with peracetic acid. One person can milk between 130 and 400 cows per hour depending on the size. Units range from 28-80 milking stalls per system. The DairyProQ is a modular based system, which allows for maintenance on a unit to be performed in normal working hours in a dedicated service room. Milking is uninterrupted by simply blocking the affected stall. If you are looking at robotic milking systems then we can supply and install the GEA MIone. Installing an MIone robotic milking machine means your life will no longer be ruled by rigid milking times. 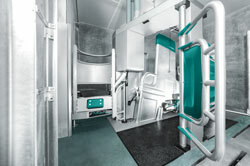 Offering flexibility both for the development of your farm as well as for your personal time management, the special thing about the MIone is that it is not placed as an isolated set of equipment somewhere in the milking parlour, but is an intelligent integral part of a sound overall concept. The MIone is effectively at the heart of a milking centre. As the cows determine their own milking time, you benefit from more time for herd management or other activities that might otherwise be forced to slip down your to-do list. In this respect, the proven milking technology of GEA offers high milk quality combined with the optimum comfort for your cows. With the latest and unique teat locating technology from GEA the MIone quickly and easily detects the position of the teats on the udder. A 3D-direct camera secured to the cluster arm simultaneously sees the teat-cups and the teat, bringing both directly in contact with each other, and thus ensuring that attachment is both quick and secure. Unlike some competitive systems the camera is not sensitive to oblique sources of light. Furthermore, the process allows the camera to be mounted in a position where it is best protected against dirt and kicking cows. 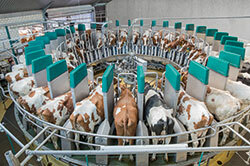 As, in the MultiBox concept, the robot arm for placing the teat-cup immediately moves on to the next stall or next cow after having carried out its task it never remains under the cow during milking. The system additionally ensures that the risk of possible damage is further reduced. Watch the videos of the MIone automatic milking system and visit GEA automatic milking website for more information. The latest innovation in robotic milking from GEA is the new Monobox. Available in the UK in 2016 the Monobox is suitable for farms with 70 cows or less. The box adjusts to allow for optimal positioning of every cow making it suitable for mixed herds. 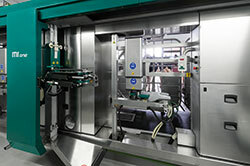 It uses the same equipment as the robotic units featured on the stalls of the DairyProQ rotary where the entire milking process is carried out automatically including attachment, pre-dipping, stripping, milking, monitoring, post-dipping, detaching and cluster flushing and disinfection. Click on the logo to visit the website dedicated to robotic milking and automated equipment for dairy farmers.